If you were in the city and got up very early yesterday morning, you may have gotten a celestial treat. 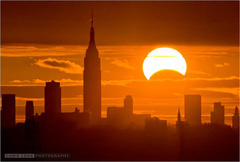 "Solar and lunar eclipses – like gathering at Thanksgiving – belong to families. And these eclipse families are called "saros," a series of eclipses related over time, occurring over a span of several hundred years. This Nov. 3 solar eclipse is the 23rd eclipse of Saros 143, a series which started on March 7, 1617 and which ends April 23, 2897 – for 72 eclipses in a span of 1,280 years."